This semester we have had two excellent seminars on space weather forecasting using sunspot and x-ray observations of the sun. The reported investigations have focused on methods for predicting solar flares using studies of X-ray emission data from satellites such as GOES and RHESSI. By investigating the variation of the sunspot distributions using datasets such as the Debrecen Data (SDD) it is possible to forecast solar flares significantly in advance of current methods. Solar flares and CME's are both explosions that occur on the sun the events are quite different. Solar flares are classified as A, B, C, M or X according to the peak flux (in watts per square metre, W/m2) of 100 to 800 picometre X-rays near Earth, as measured on the GOES spacecraft. 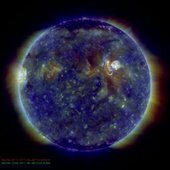 The following SDO video provides an interesting visual overview of the different kind of events. 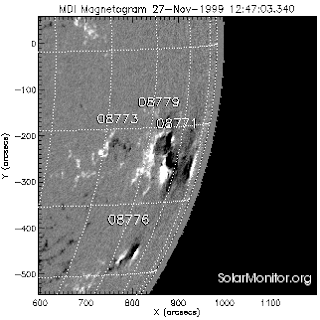 An example HMI magnetogram of an active region is shown below shortly after the occurence of a C2.7 class flare which occurred at 2036. We observe two groups of opposite polarity in close proximity. 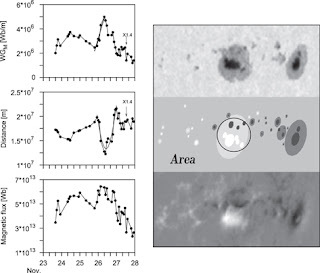 Understanding flaring phenomena requires a detailed study of the magnetic field configurations and the study of reconnection phenomena. 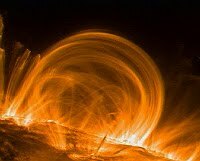 Although coronal loops are remarkably stable for long periods it is a study of instability which can reveal the mechanisms resulting in the generation of solar flares. Understanding the flaring events requires a detailed study of the stability of the magnetic flux ropes participating in reconnection events, also important is the interaction of the flux rope photospheric footpoints. The animated gif below, illustrates the change in the configuration of the magnetic field occuring during a reconnection. Such processes may be driven by huge mechanical motions of more dense plasma within the photosphere. The discussion of the Debrecen sunspot data collection presented the new insights into pre-flare and Coronal Mass Ejection behavior and the evolution of the Active Regions (ARs). This was achieved by analysing the SOHO/MDI data and the Debrecen Data sunspot catalogues. 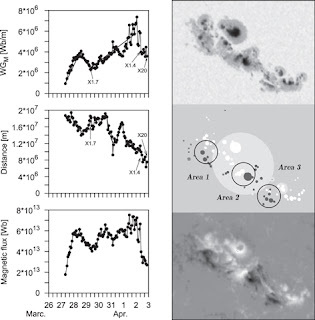 This is a statistical study of the spatio-temporal distribution of precursor flares before major solar flares, how is this achieved and how does it link with the physical phenomena generating the events. The curve fit is satisfied when |K1| = 265 gauss and |K2| = 1067 gauss. This function relates a Bmean magnetic field to an A umbral area. 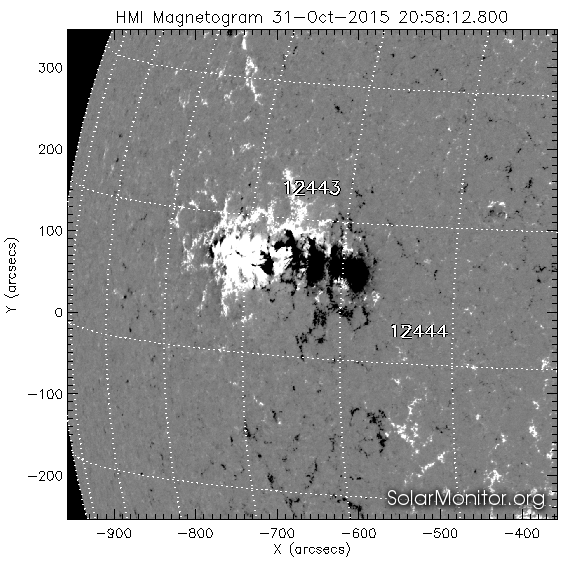 The study of the sunspot magnetic fields and the associated gradient GM revealed a number of interesting features. There is a rise in GM of around 2 days prior to an event. The maximum in GM is around 3MWb/m, after the maximum and before the flare event this decreases, the fluctuations during this phase are indicative of the pre flare dynamics. Of 57 events studied, for half of them the flare occured within 10 hours after the maximum of GM. In the second paper the method was updated and employed the weighted horizontal gradient of the magnetic field (WG_M) defined between opposite polarity spot-groups at the polarity inversion line of active regions (ARs). This parameter provides important diagnostic information about the accurate prediction of onset time, on the flare intensity and towards CME risk assessment from C class to the X class flare. The revised method computes the flux gradient for sunspot groups in addition to confirming the earlier results, the new method improves the information which can be obtained about flare events. If the maximum flare energy is less than 42% of the energy stored in the group further flares are more likely. The method improves the estimation of the onset time for flare events. NOAA AR 8771, for 1999 November 23–26. Right column: continuum white-light image (top), reconstruction from SDD (middle), and magnetogram (bottom). 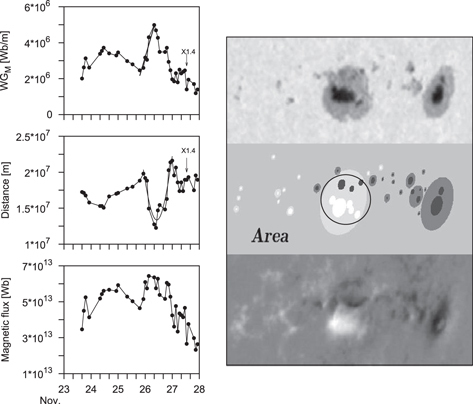 Left column: variation of (top), distance between the area-weighted centers of the spots of opposite polarities (middle), and unsigned flux of all spots in the encircled area (bottom). 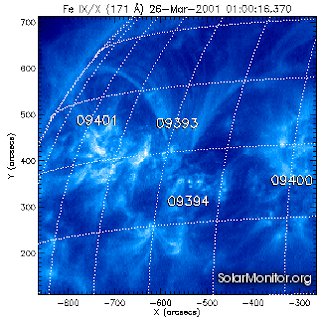 but of NOAA AR 9393 with a single (i.e., X1.7) and multiple (i.e., X1.4 and X20) flares, for 2001 March 26 April 3. For these studies a lot of use was made of potential field theory and non-linear force field theory to predict the fields at different levels from magnetograms with the proxies these were then used to predict flare occurrences 10-12 hours in advance. Further studies of the variations of solar non-axisymmetric activity have been used as predictors of geomagnetic activity. The dynamic properties of the active longitudes may be of predictive importance. The most flare-productive active regions tend to be located in or close to the active longitudinal belt. This may allow to predict the geoeffective position of the domain of enhanced flaring probability for a couple of years ahead. The magnetic flux emergence exhibits a fluctuation of 1.3 years within the active belt, this fluctuation is absent out of this belt. The observed behaviour may allow an estimation of the time intervals of higher geomagnetic activity for a couple of months ahead.